LT School is Responsive WordPress theme. The theme represents a clean and modern design, which makes it suitable for educational type websites like school, college, university or any kind of educational websites. 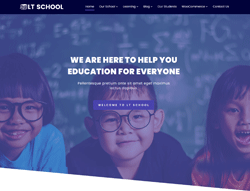 School WordPress theme comes with a responsive and mobile-friendly design that makes your website look spectacular across all screens, tablets and mobile devices. With this theme, you can expect to find lots of advanced options like strong shortcodes, highly customizable theme options and a wide variety of gallery and portfolio layouts. Besides, we also offer support services like drag-drop layout content, Bootstrap CSS & Hybrid framework, unlimited color and a color picker in the admin panel. This is the right theme to create professional and custom looking website for any educational purposes.